There are more than 200 hair salons in Irvine, California. Wondering where to find the best hair salons in Irvine, California? Look no further. Here you will find out where the different Irvine salons are located, and what they specialize in. Located in Orange County, Irvine is a populated area that offers a wide range of conveniences to residents. One such convenience is the large number of hair salons. In all, there are more than 200 hair salons in Irvine, California. While it is nice to have so many different choices, it can be difficult to find a reputable salon that is located near your home and offers the type of services you need. If you need assistance, you will find a selection of large and small hair salons below. It should be noted that the following hair salons are listed in no particular order, and represent only a portion of what can be found in Irvine. Located at 17777 Main Street in Irvine, the Glamour Den Full Service Salon is the type of hair salon that most women dream about. The décor is very feminine, chic, and pleasing to the eye. 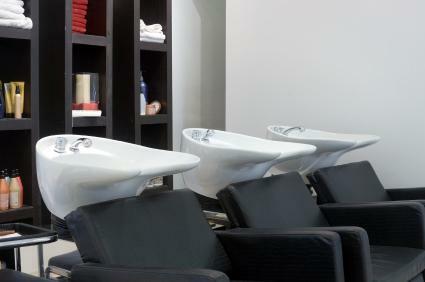 You will also notice a complete lack of the chemical smell that permeates most salons. The Glamour Den specializes in numerous hair services, including cutting, coloring, hair highlights, perms, styling, hair extensions, and much more. Other popular features include good parking, one-on-one service, and flexible appointment times. The AG Lounge for Hair is located at 14980 Sand Canyon in Irvine. The salon was voted "Best Salon" in Orange County. Every stylist employed by the AG Lounge for Hair has been trained by Paul Mitchell, Toni & Guy, and Vidal Sassoon. The salon specializes in precision cutting and advanced hair color placement, but the high-end, professional setting is a great place to get styled, extensions, and more. Visitors will feel pampered when they are greeted at the door, handed a glass of wine, and encouraged to relax. Located at 4250 Barranca Parkway in Irvine, Shadows Hair Salon serves all ages, employs 10 expert stylists, and sells a full line of hair care products. The salon has been newly remodeled, and provides just the right amount of ambience. Another bonus is that each hair station features up-to-date equipment. Shadows Hair Salon specializes in coloring, color correction, precision cutting, Japanese hair straightening, threading, and styling. Voted "Top Salon" in Orange County, Maxwell's Salon of London is located at 5315 University Drive in Irvine. The salon is known as a relaxing retreat due to the location beneath the scenic Turtle Rock foothills. Maxwell's Salon of London employs a large, professionally trained staff and specializes in everything from cuts and styling to highlights and coloring. Appointments are recommended, but new walk-ins are always welcome. Located at 4622 Barranca Parkway in Irvine, Rainbow Kids Hairstyling is part of a California franchise. There are Rainbow Kids salons located throughout Orange County; locations include Irvine, Huntington Beach, and Westminster. Services include low-priced cuts, styling, updos, chemical services, and braiding. Rainbow Kids caters to kids and adults, and there is a very family-friendly atmosphere.